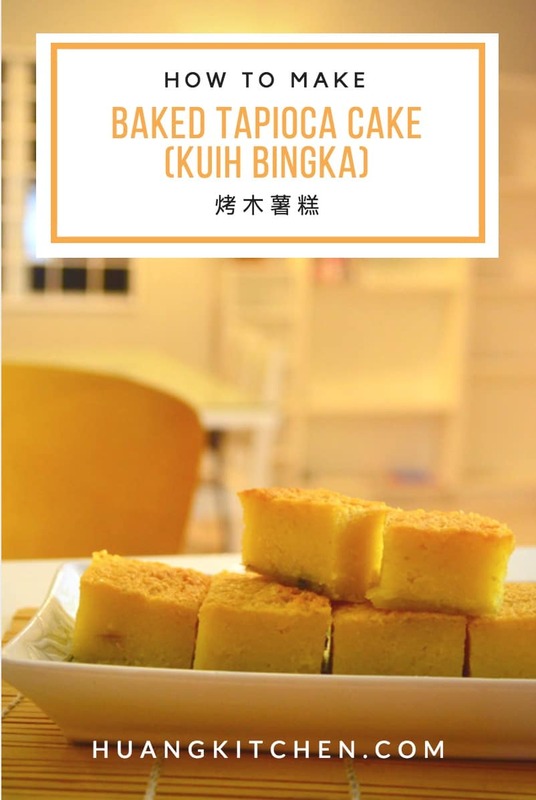 Baked Tapioca Cake, also known as Kuih Bingka Ubi Kayu, is a very popular sweet delicacy. 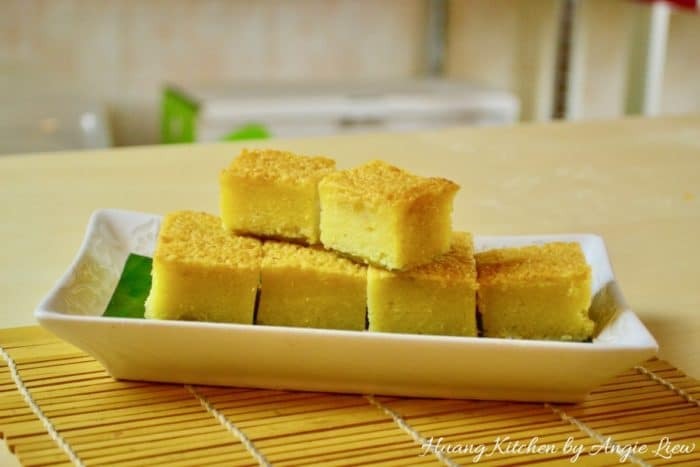 This traditional Malay/ Nyonya kuih is semi-soft, chewy and extremely fragrant. It has an inviting aroma from the aromatic pandan leaves, fresh eggs and undiluted coconut milk. 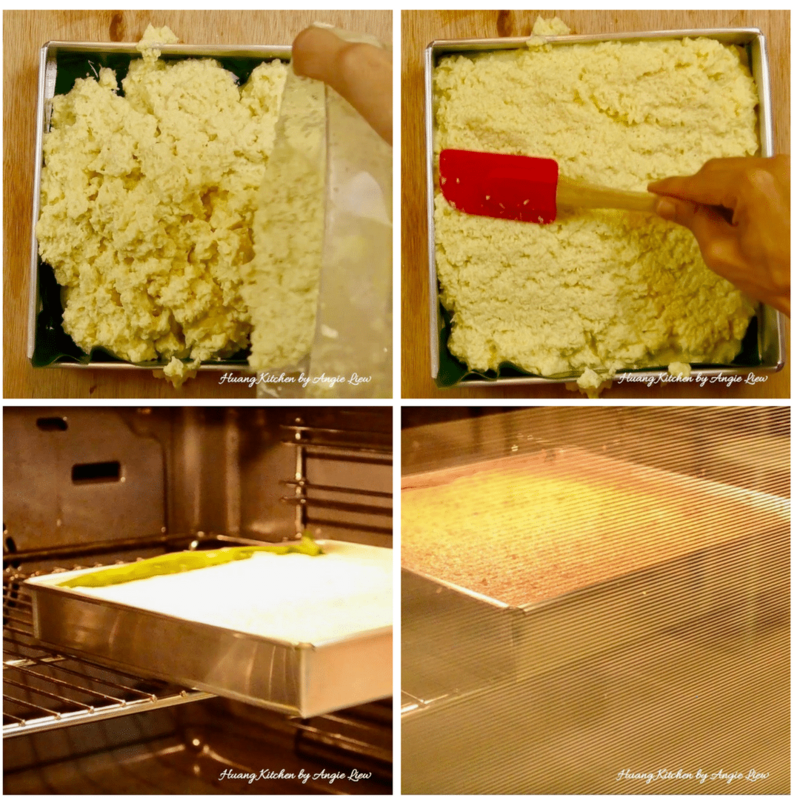 And the good news is its so much easier to make this baked tapioca cake compared to other types of kuih. You just need to mix everything together and bake. Above all, it’s such a forgiving cake. If you find that the cake is under baked, simply return it into the oven to continue baking till completely done. And it will still be as delicious. Only when you have taken a bite then you can understand the magic of this chewy and delectable traditional kuih. 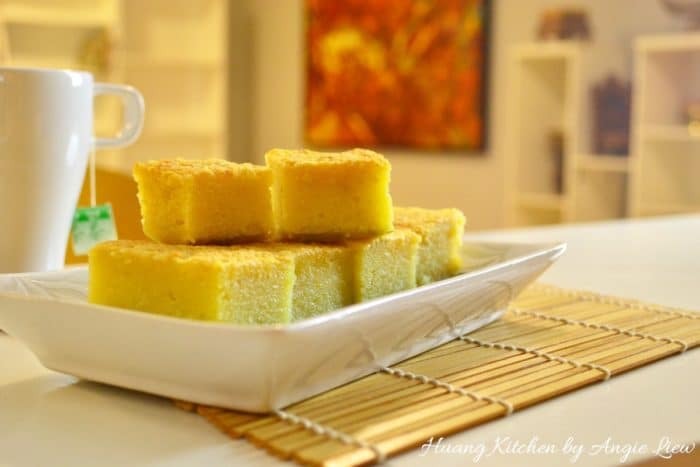 Enjoy these freshly baked tapioca cake in the afternoon complimented with a cup of tea or coffee with your loved ones is the best thing you can spend the afternoon on. 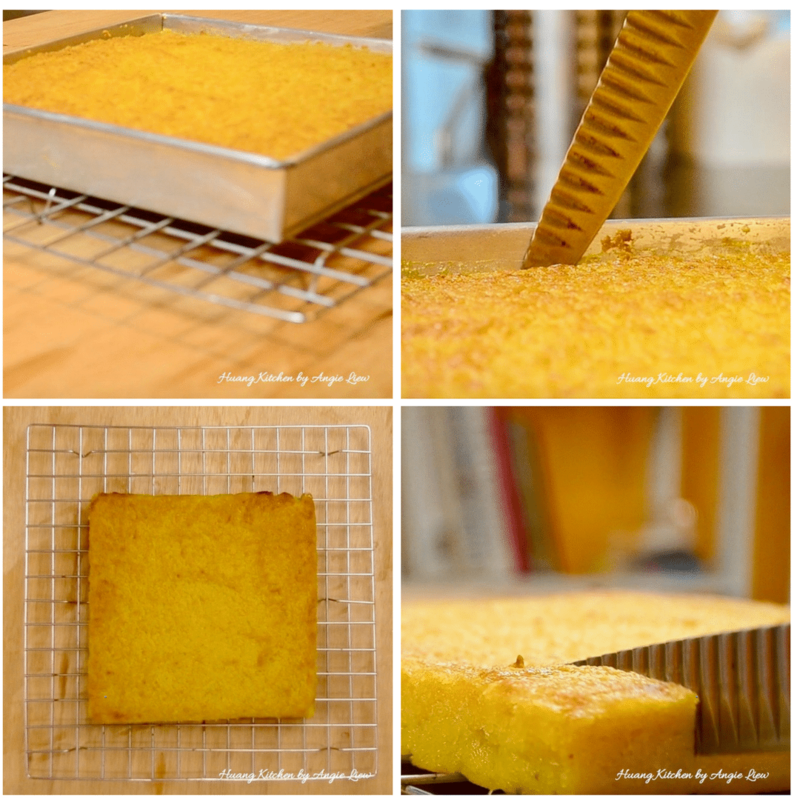 This Baked Tapioca Cake, or known as Cassava Cake is amazingly fragrant and addictive! Made with freshly grated cassava, filled with the fragrance of coconut milk and pandan leaves. It's just so good, a pan of this is hardly ever enough! 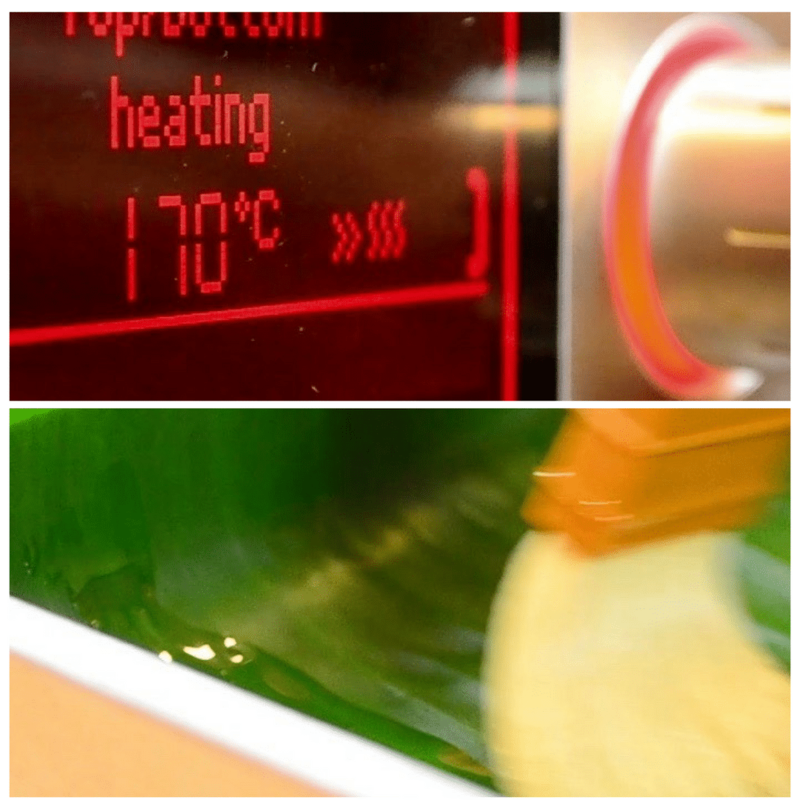 First preheat oven to 170 degree C. Then line a 23x5 cm square cake tin with banana leaves (oiled on shinny side). Peel yellow tapioca tubers (1.3 kg) and grate finely. The grated tapioca should weight 1 kg. Then place the grated tapioca in a strainer over a bowl. Leave for 30 minutes to allow juices to drain into the bowl. Pour off the liquid in the bowl slowly, leaving behind the tapioca starch at the bottom of bowl. Put the strained tapioca into the bowl and mix well with the tapioca starch. 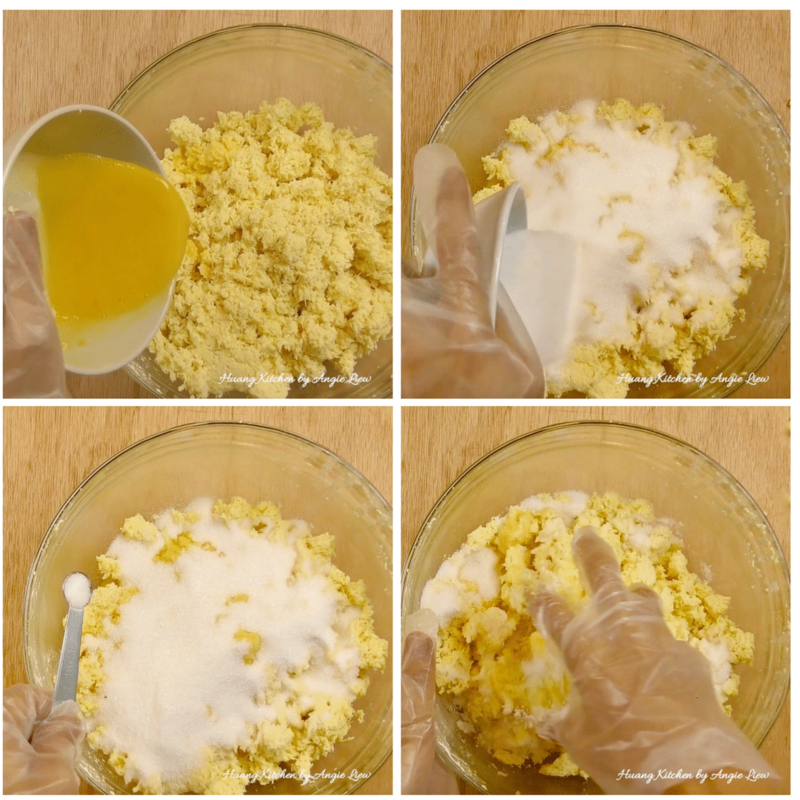 Add sugar, beaten eggs and salt. Mix well until the sugar dissolved. 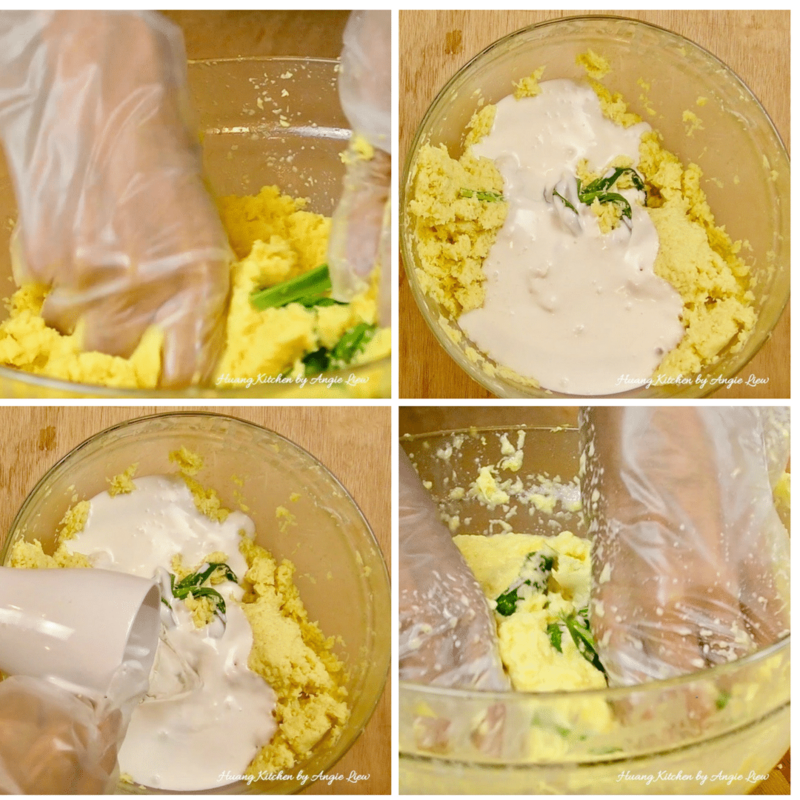 Knead, squeeze and twist pandan leaves into mixture till completely crushed. Then add in the coconut milk and water. Mix thoroughly. Discard the pandan leaves after that. 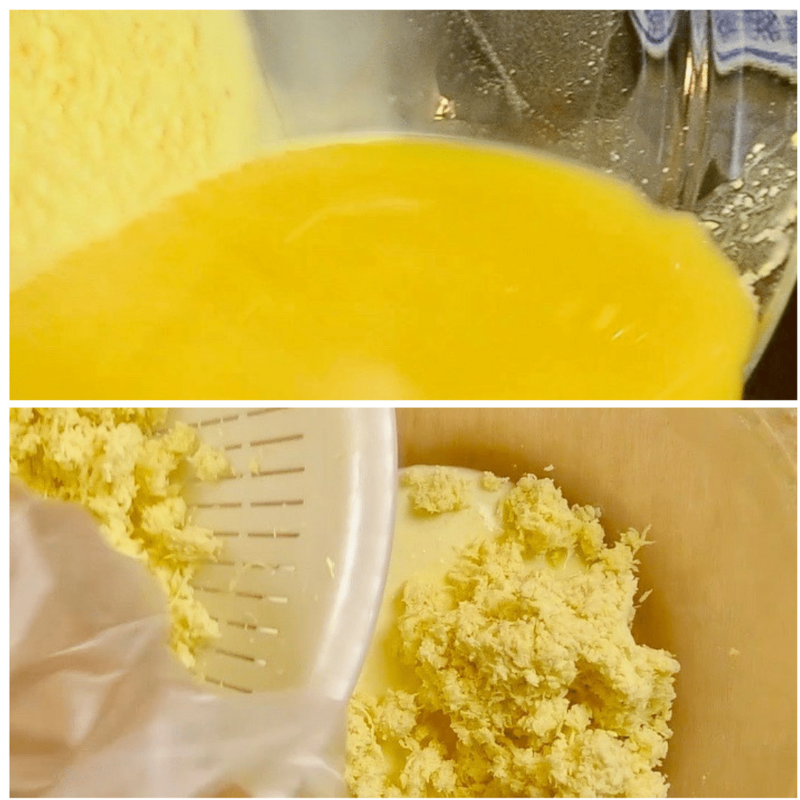 Pour batter into cake tin in a circular motion as you pour. Smooth the top with a spatula and make sure batter is evenly mixed. Bake in preheated oven for 11/4 hours or until top is golden brown. Do not over bake or the cake will be dry and tough. Remove cake from oven and cool on wire rack about 30 minutes. 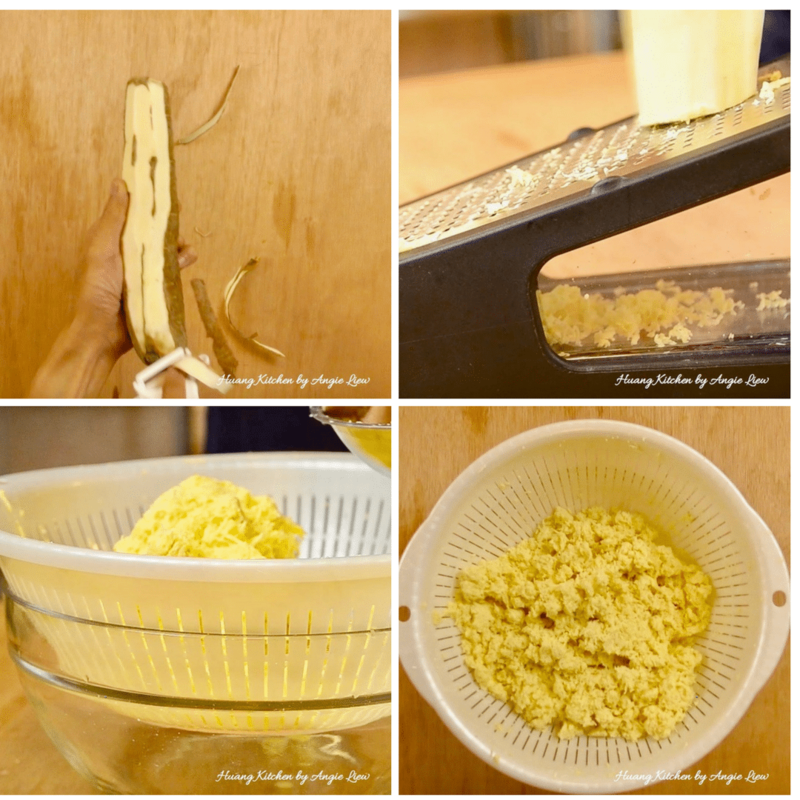 Unmould and leave the cake on wire rack to cool completely (about 1 hour). 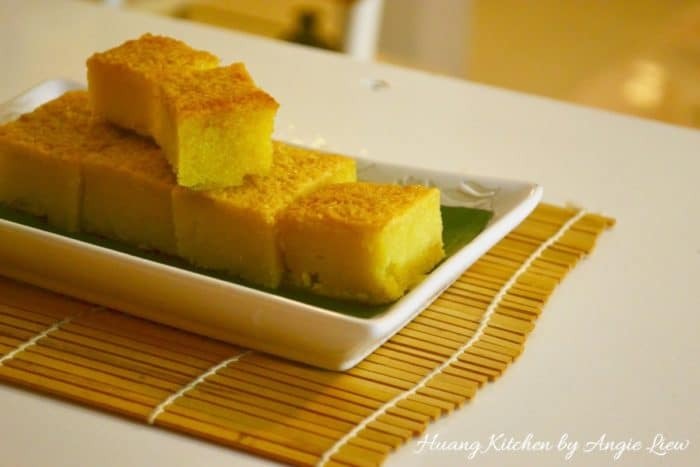 Using an oiled knife, cut tapioca cake into neat cube or rectangle pieces. 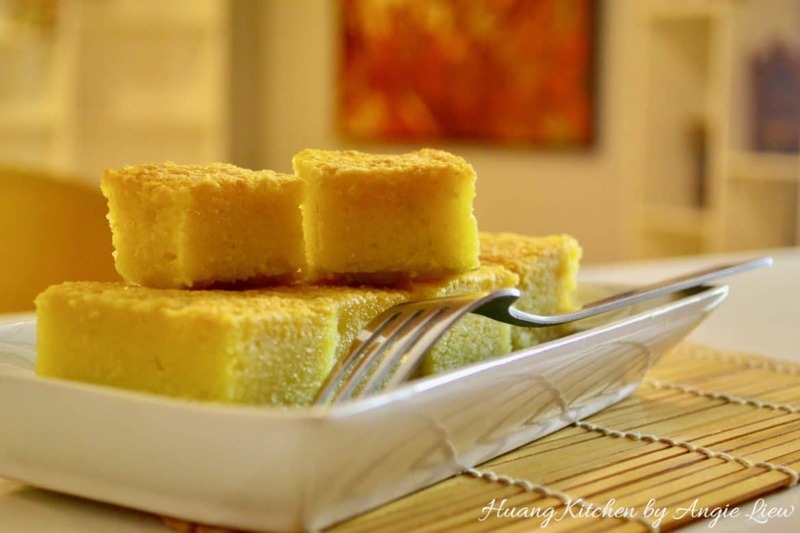 Best to serve the baked tapioca cake at room temperature. As always, ENJOY! Tapioca comes in both yellow and white varieties. Best to use the yellow variety for its golden colour texture. For leftovers, wrap and refrigerate. Cut and rebake till thoroughly heated and soft. Avoid grating the tough fibre that runs down the centre of the tuber. It's best to remove this fibrous core as it will cause bitterness in the cake if the tapioca is not fully baked.